Western blot analysis of whole cell lysates probed with LDHB antibody followed by detection with Donkey anti Sheep/Goat IgG (Fc):HRP (1/10,000, STAR88P) and visualized on the ChemiDoc™ MP with 34 second exposure. Arrow points to LDHB (molecular weight 37 kDa). Goat anti-human LDHB antibody recognizes L-lactate dehydrogenase B chain, also known as LDH heart subunit, epididymis secretory protein Li 281, lactate dehydrogenase H chain or renal carcinoma antigen NY-REN-46. Goat anti Human LDHB antibody recognizes the L-lactate dehydrogenase B chain, also known as LDH heart subunit, epididymis secretory protein Li 281, lactate dehydrogenase H chain or renal carcinoma antigen NY-REN-46. The LDHB gene encodes an enzyme which catalyzes the reversible conversion of lactate, pyruvate, NAD and NADH, in the glycolytic pathway. Mutations in LDHB are associated with Lactate dehydrogenase B deficiency (LDHBD). Pseudogenes have been identified on the X chromosome and on chromosome. Multiple alternatively spliced variants, encoding the same protein, have been identified (provided by RefSeq, Mar 2010). 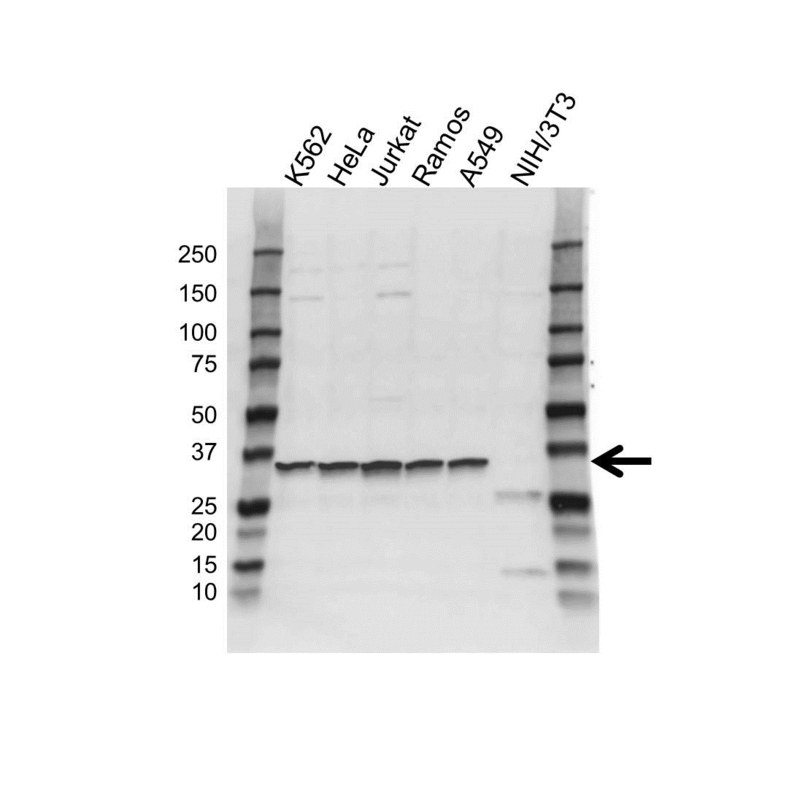 Goat anti Human LDHB antibody detects a band of 37 kDa. The antibody has been extensively validated for western blotting using whole cell lysates. Anti LDHB detects a band of approximately 37 kDa in A549 cell lysates.